is away from parents for whatever reason – moms get busy! 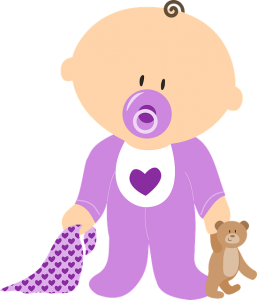 is teething, tired, or cranky – babies have bad days too! Indirect reasons like a new baby or a move to a new house can also affect your little one’s happiness and sense of security. Some of these circumstances show up when baby is an infant, and others don’t happen until a little later in life, but no matter what, having a personalized baby security blanket will help comfort them and ease transitions. The Early Childhood Parenting Center (ECPC) thinks that infant’s feel as though their mothers are extensions of them. In other words, when an infant is without his mother, he feels as though part of himself is missing. To the infant, it is sort of like leaving home without a leg. Part of you is missing, which causes pain in the form of panic and anxiety. Although this particular scenario fades away after the first few months of life, there are plenty more where it came from. Let their baby blanket be an extension of you. It takes babies quite some time to realize that their mother still exists even when they can’t see her. A personalized baby security blanket can help with this as well. When Mommy isn’t there, Baby can snuggle and smell her blankie, which will remind her of her mother and hold her scent as well. When your baby is having trouble getting to sleep in her own bed, she can soothe herself with her Minky baby blanket. One thing that makes a personalized baby security blanket from the Minky Moon so much better than others is that they are fade and stain resistant. Baby blankets get filthy from being carried all over kingdom come, but with ours, you don’t have to worry about so many washings or the blankie falling apart when it does need washed. Our blankets are all handmade from the highest quality Minky fabric and stand the test of time. Design a personalized baby security blanket for the baby in your life today! This entry was posted in Personalized Baby Blankets on December 22, 2015.